Think of this as a very early black and white version of the cinematic poem-films of Koyaanisquatsi and Baraka. 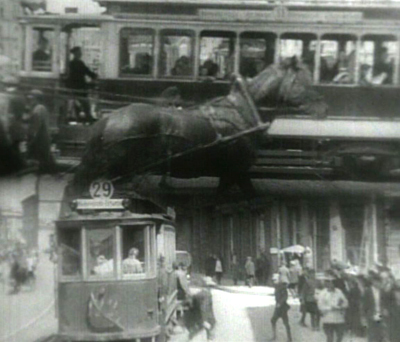 Filmed in Russia in 1929 it records the hustle and bustle of ordinary life. 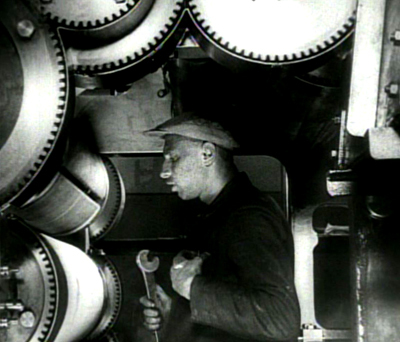 In filmic style it foreshadows many of the techniques used in Koyaanisquatsi and Baraka — time lapse clips of city traffic pulsating organically, montages of people working, fighting, loving, living, and since this is Russia, a photographic celebration of machines at work. But unlike the later films, this one has a curious recursive dimension. 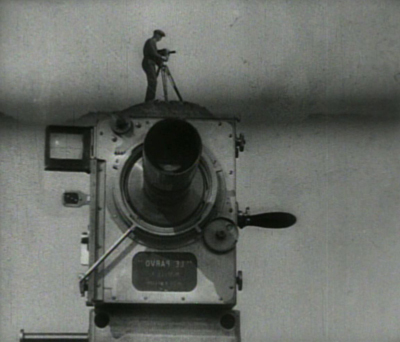 The man with the movie camera (the filmmaker himself) appears throughout the film, busily making the film as one of life’s many activities, and the film ends with an enthusiastic theater audience watching this very film. At a distance of 90 years, I found the particulars of everyday life in Russia more interesting than the general ode to life. But both work. The silent film has been smartly and modernly scored from notes left by the filmmaker. There are three versions for the sound track of this film on DVD. 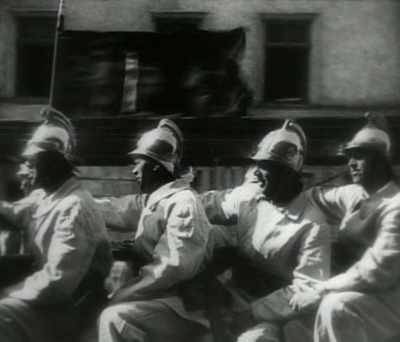 The original film was silent with a score suggested for live orchestral accompaniment. 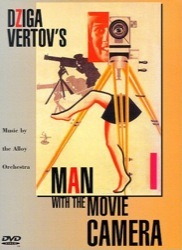 In the version I watched — the one offered by Netflix — Alloy Orchestra used those original musical notes to create a vigorous new score with appropriate sound effects. There are two other contemporary versions, including a score by Michael Nyman, available for sale. The film’s entry on Wikipedia can help you sort these out.